Some of my recent work on housing markets, mortgage lending and housing search has led me to consider the question of where, exactly, London's new housing is located. On a recent visit to King's Cross I was amazed by the sheer scale of development, particularly all the new flats. 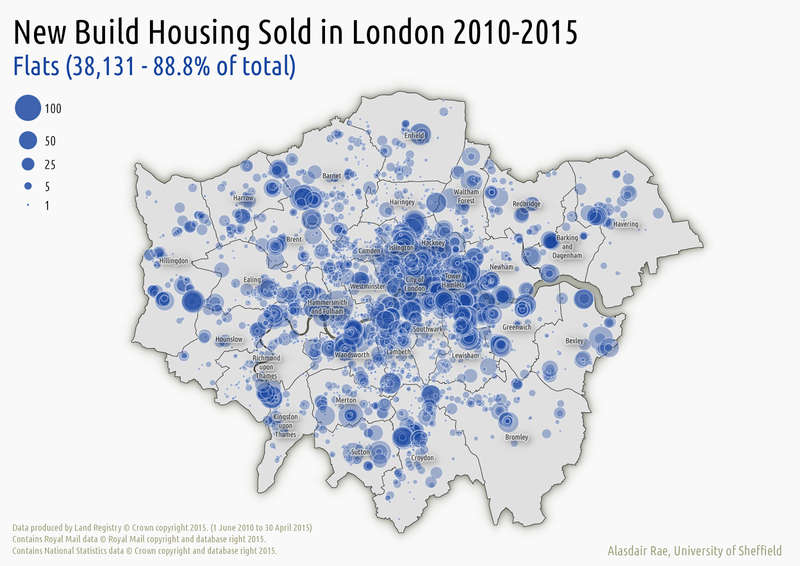 Because I've been working with the data for another project - and recently re-examined it for a project proposal which explicitly didn't focus on London - I thought it would be interesting to see whether my perception of the flats boom is based in reality. Of course it is! The maps below are based on all new build homes sold in London from 1 June 2010 to the end of April 2015 (the most recent data). 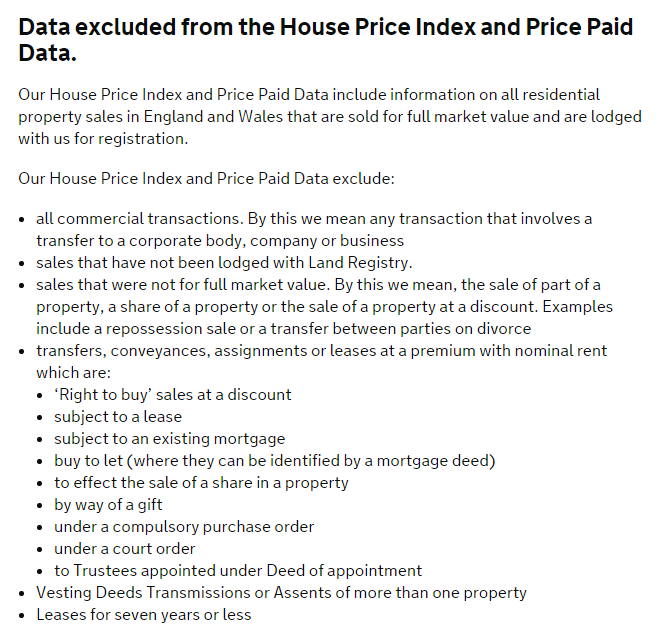 During this time, according to HM Land Registry 'price paid' data, there were 42,938 transactions on 42,813 properties. 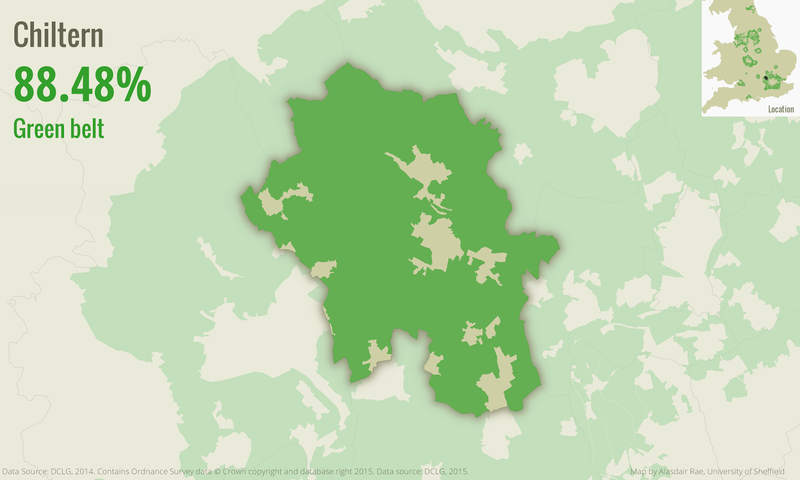 This indicates that quite a few properties are not being picked up in this dataset - e.g. compare it to the completions data from the London Datastore. 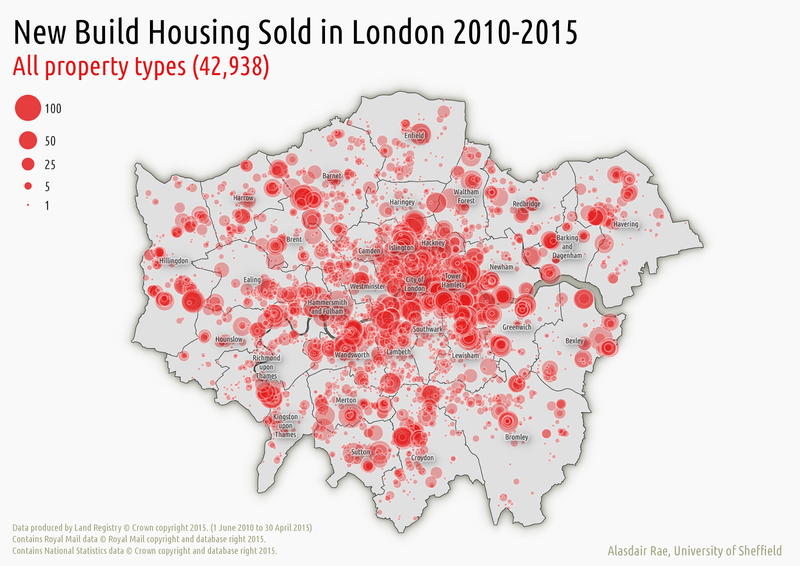 Nevertheless, the patterns and distribution of property types is revealing. 88.8% of transactions were for flats, 7.1% for terraced houses, 2.4% for semi-detached properties and 1.7% for detached houses. 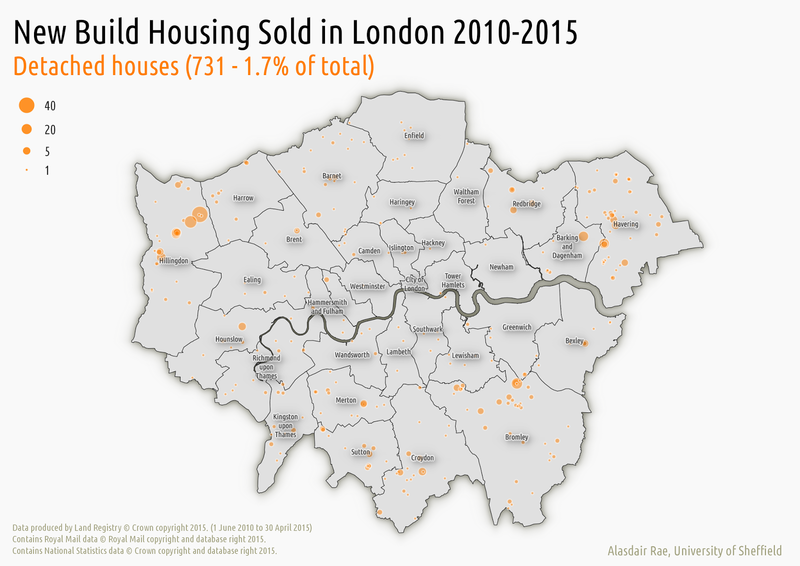 Clearly, the mix of new housing - and its relative low volume - is something that many people have commented on before, but I've not seen many people look at the geographical distribution in this way. The important questions arising from these maps - as ever - is why are things the way they are? 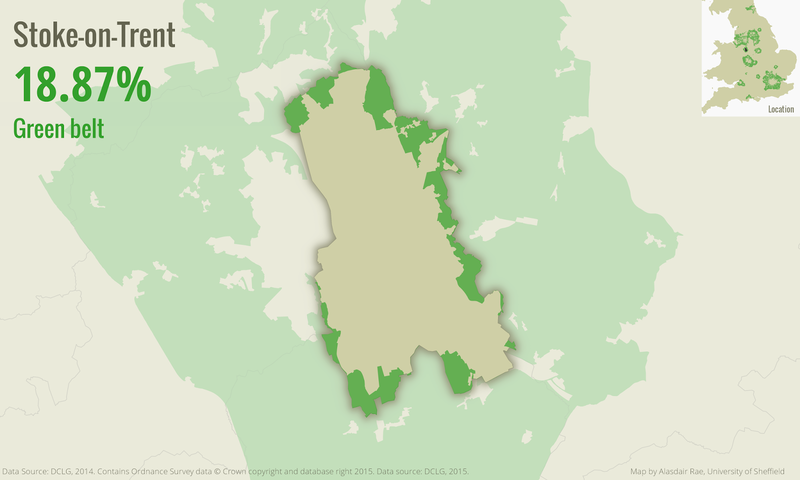 That's something the maps can't tell us but it does provide an interesting starting point for debate. 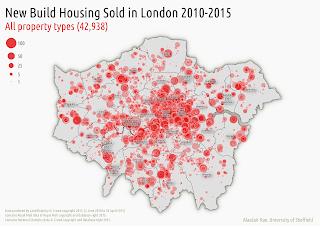 The discrepancy between the Land Registry data and data on completions is also not surprising owing to the way new build housing is sometimes sold, but it would be interesting to explore this more in future. If you do happen to have a few million quid to spare, good luck finding a new detached London house to live in! A note on the maps... 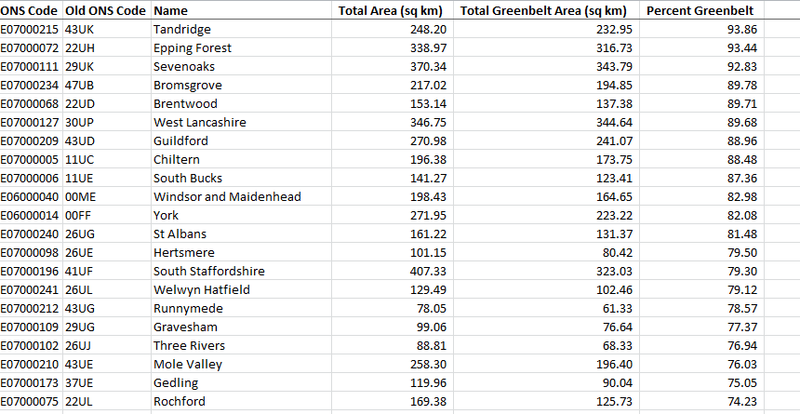 I've geocoded the price paid data using Ordnance Survey's Code-Point Open dataset, which can match sales to postcode units, rather than street addresses. 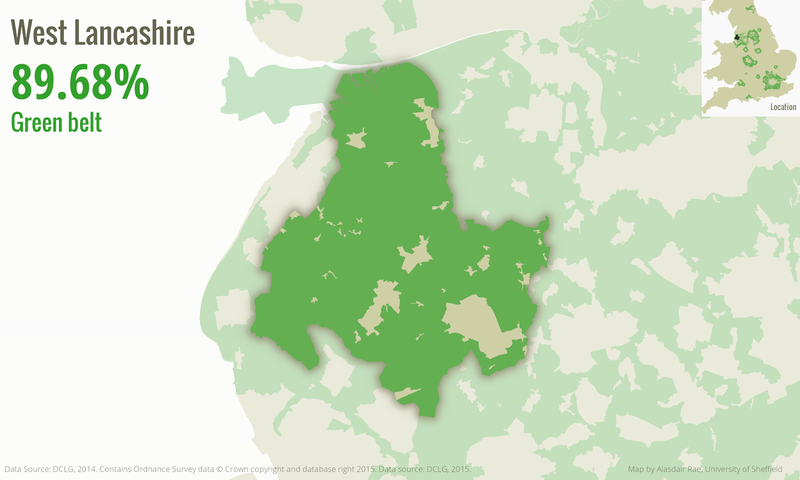 The transparent bubble map is of course far from perfect but I've used it here to convey the scale and location of new housing, rather than to offer a precise fix. 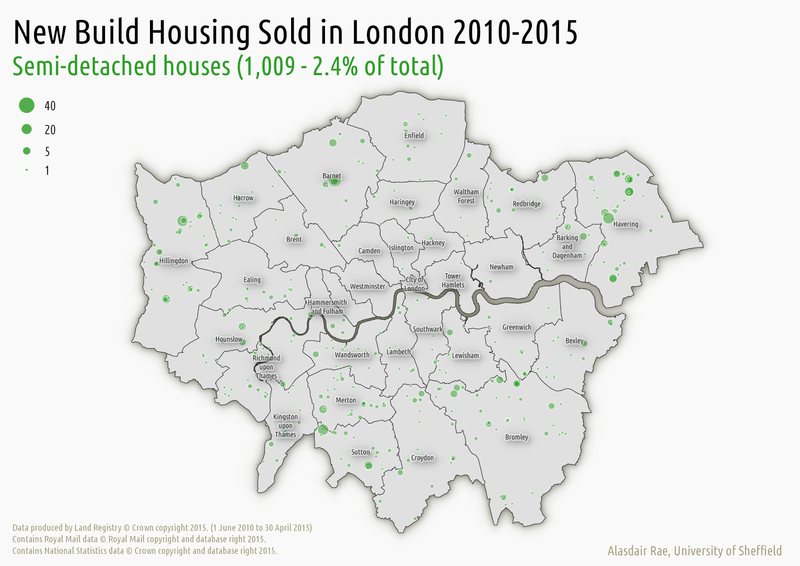 So long as it gives the impression of there being a massive splodge of newbuild flats in Central London that'll do for now. 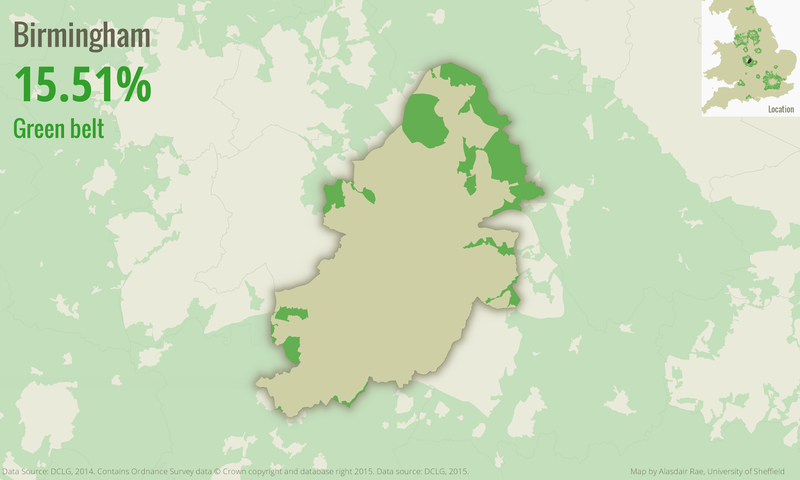 I am aiming to highlight the general scale and geography of development as a fairly quick experiment to see what might be done with the data. No plans to make it interactive (update: the best laid plans of... see map point datadump below). Update (1715, 22 June 2015): I fixed the glitches, which were caused by a rogue space here and there in the codepoint open file. Moral of the story? Build more houses (I think). Always a giveaway when there aren't many dots in Wandsworth. The numbers were correct all along though. 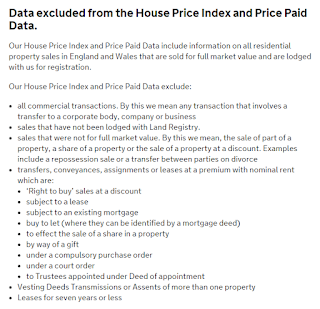 Finally, I've added in some information from HM Land Registry on properties not included in the price paid data. I've had a rush of blood to the head so here I am with a second blog in two days. 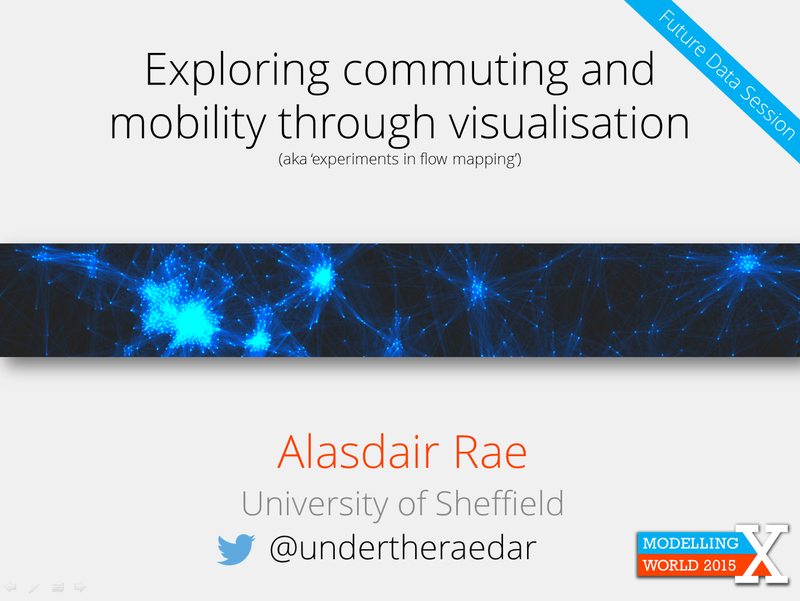 I'm getting some slides ready for tomorrow's Modelling World 2015 talk in London, which is all about visualising mobility (see below) so I wanted to add in a couple of new visuals on commuting in and out of London. 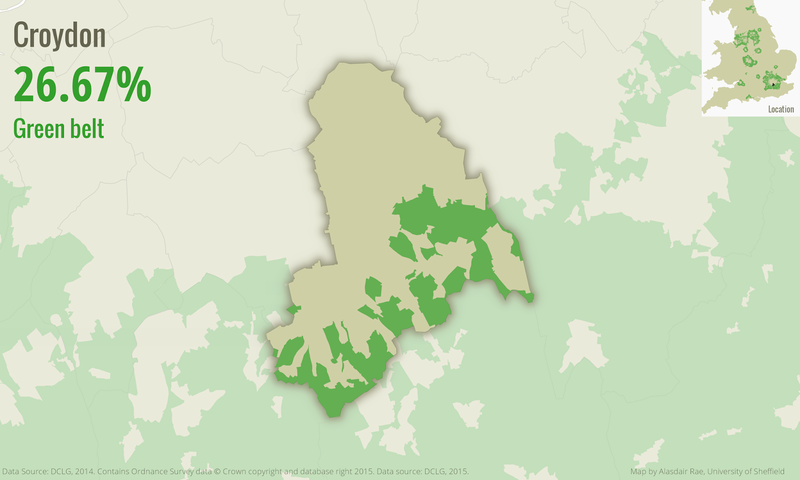 Visualisation can often be just a lot of fancy graphics. This can be useful in itself for a number of reasons (e.g. 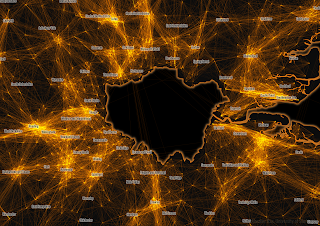 capturing attention on an important issue, drawing attention to unusual patterns in a dataset) but since I've been working with commuting data in England and Wales I wanted to focus on flows into and out of the City of London. This interests me for a number of reasons, including i) commuting can play a significant role in wealth creation and it also needs to be understood in relation to how we measure GVA; ii) commuting is often very stressful and damaging to the individual - particularly long commutes - so I'm interested in the kinds of distances involved and this can be seen easily on a map; iii) commuting can often be environmentally damaging - though this isn't what I'm mapping here; iv) commuting in and around London is often about green belt hopping so I was curious to see how much commuting comes from beyond the metropolitan green belt; and v) commuting is a two-way process and affects places at both ends and in between due to travel. You should be able to get a better view of the images by clicking on them individually and if you want them to work more quickly try saving them to your own machine. 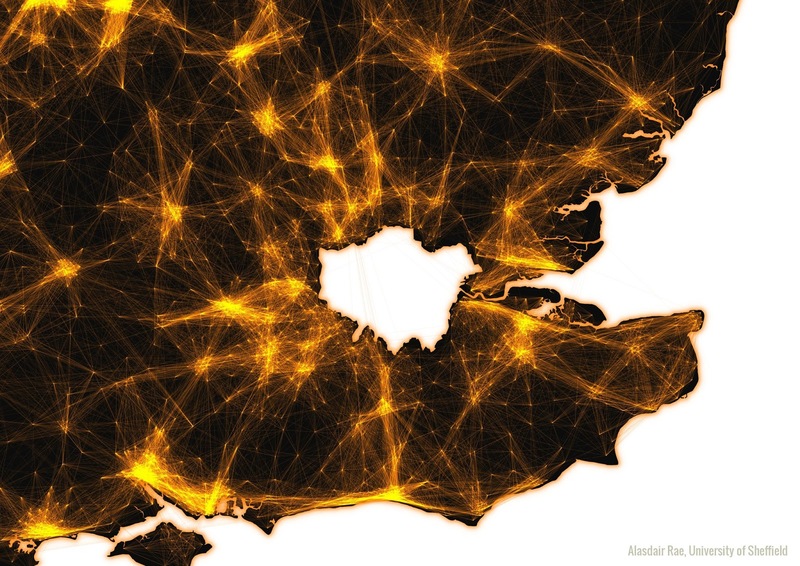 Tweets yesterday from Michael Edwards and Joseph Kilroy reminded me of a map I produced last year in which I showed commuting patterns in South East England, minus London. I did this to get a sense of the polycentric nature of travel to work in the South East as this has been a topic of many previous studies - including the famous Hall and Pain book - but none (to my knowledge) using the 2011 Census data I mapped. 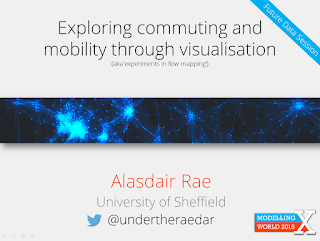 The other reason for me blogging about this today is that I'm speaking on a similar topic at Modelling World 2015 this Thursday in London. Enough words, time for some maps, which I've refreshed for this week. The first map below shows all commuting in the South East of England in 2011, without place names. As you can see, I've removed London from the equation, both in relation to travel to work flows and from the underlying map canvas. This gives a slightly different perspective than the one we're used to. 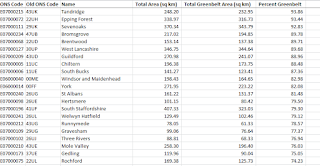 The second map is the same as the first but I've added the names of local authorities in order to help identify places. Click any of the images to enlarge. 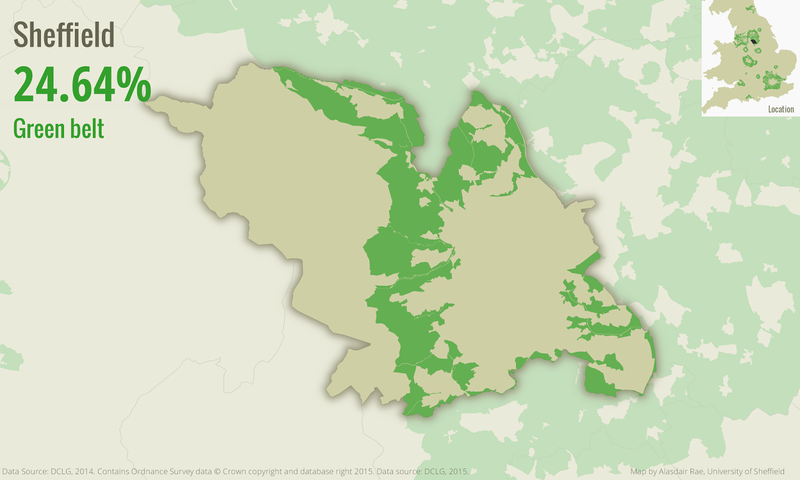 Now, here's what it looks like when you add London back in... Kind of brings to mind astronomical metaphors, as hinted at in a previous study by the RTPI. I should add that the definition of a supernova is 'a star that suddenly increases greatly in brightness because of a catastrophic explosion that ejects most of its mass' so this might be stretching things slightly... Then again, if what people are saying about the displacement of the poor from London this might actually be spot on. 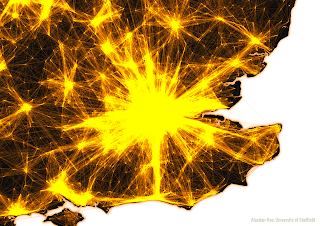 Finally, I've produced a zoomed-in version closer to London where you can see some of the flows which go through/over the capital. I don't fancy that commute!